If the past months have taught us anything, it's that there is no one right way to protest injustice. Conversely, however, there are a myriad of wrong ways to go about it, and Daniel Whitaker of Indianapolis seems to have honed in with remarkable acuity upon one of them. 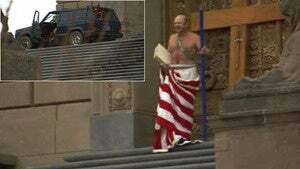 According to police who arrived at the Indiana War Memorial, Whitaker, 49, drove his Jeep Cherokee up the steps at 4:15 p.m., and emerged from the car "half naked and draped in an American flag, carrying a bright blue staff and at one point wearing a metal helmet with a plume." He then produced a container of gasoline, which he spilled down the steps and set ablaze. So far, so Lady Gaga entrance. But then things began to veer into unsettling territory: Whitaker produced a cross, and when arrested, was discovered to be armed with a semi-automatic pistol and pledging allegiance to the "Texas army." He professed a desire for things to "go back to the way they used to be, saying it was safer 50 years ago." Oh, the staircase-singed irony!